ELS 19 was our most successful Summit yet! We were visited by local vloggers My Halifax who produced this video of our Summit. 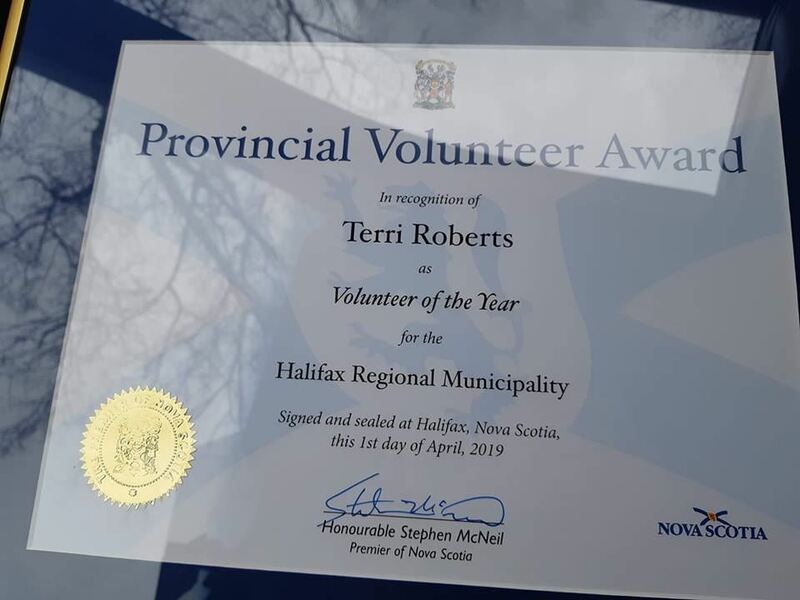 Also, congratulations to NSFA Chair Terri Roberts who received Volunteer of the Year awards from both the City of Halifax and the Province of Nova Scotia earlier this month. This year we offered something new, and all-day course that participant earn a certificate for taking. The course was SmartAlice Training about recognizing signs of domestic violence in our fitness clients. 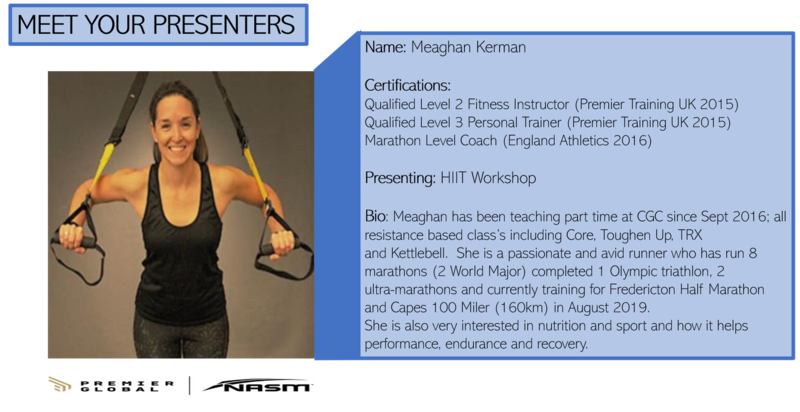 Full session descriptions and presenter information below! Please be patient with us as we collect presenter information and session descriptions! Combining movements from ballet with exercise theory from Pilates and Yoga, barre is an emerging fitness trend that focuses on core engagement, balance, and posture. Barre classes focus on muscular endurance, using body weight or small weights, balls and bands to achieve muscle fatigue. Ballet moves differentiate barre from a traditional strength training class or Pilates class and put emphasis on repetitive, smooth, small movements in multiple planes. You will gain the fluidity of a dancer without having to dance in a barre class while also gaining muscle endurance. 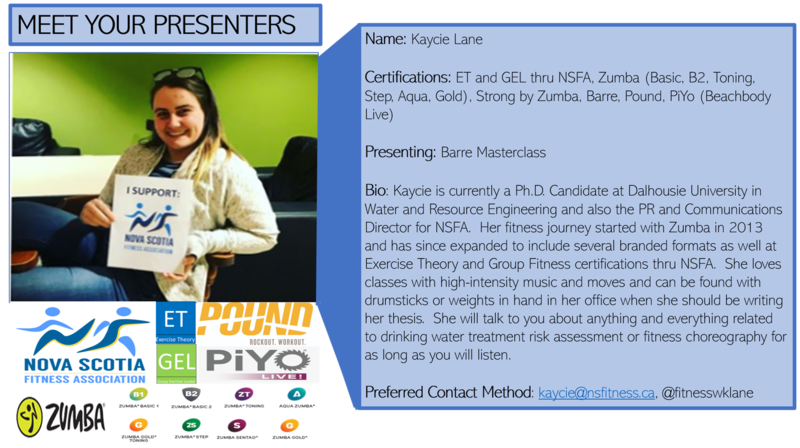 This session will be focused on showing you the differences between a barre class and a traditional strength class, providing you with a basic class outline, providing a list of agencies that can certify you to teach barre and providing you with the essential tools you need to teach or sub a barre class. 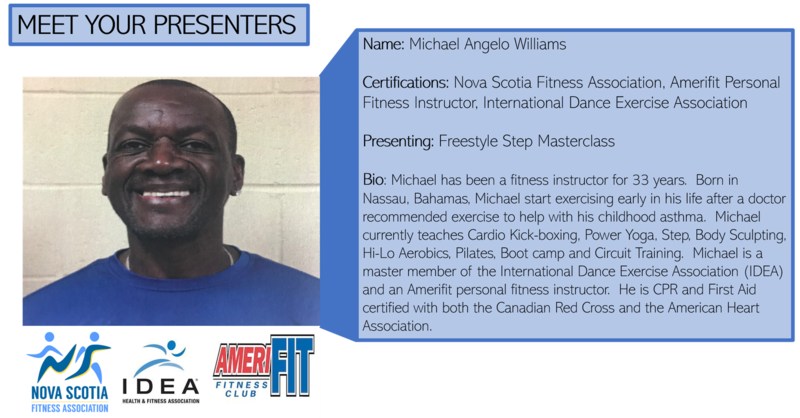 Using years of experience and experimentation in the group fitness world, Michael Williams brings you "Freestyle Step", a format he has successfully integrated into his teaching repertoire over the past years. 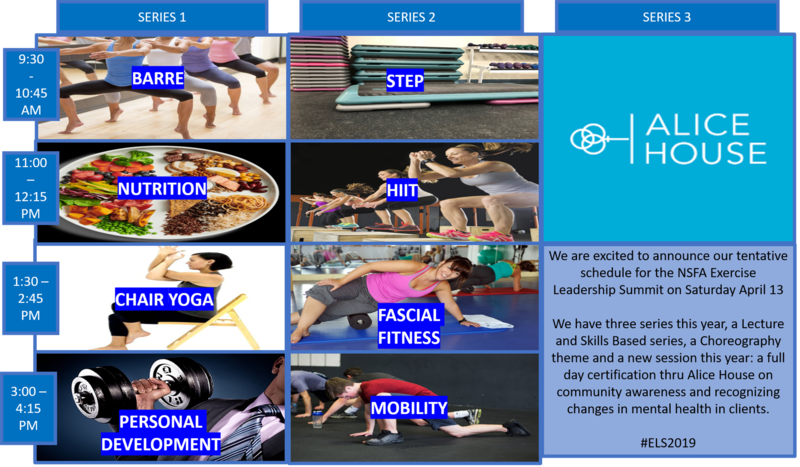 Freestyle step is a multilevel step class designed to help you teach your students low, medium and high intensity variations on traditional step moves without having to slow down the class pace. Beginners will be able to pick up the moves and regulars will be able to progress seamlessly all in one class. Come learn some interesting variations on moves you know and love in your step class from a professional with over 20 years of refining his step classes! Food influences every aspect of our lives. It influences our life styles, our weight, our interactions with others. With the constant stream of social media fads and different nutrition claims it can be difficult to decipher even basic nutrition information for yourself or your clients. 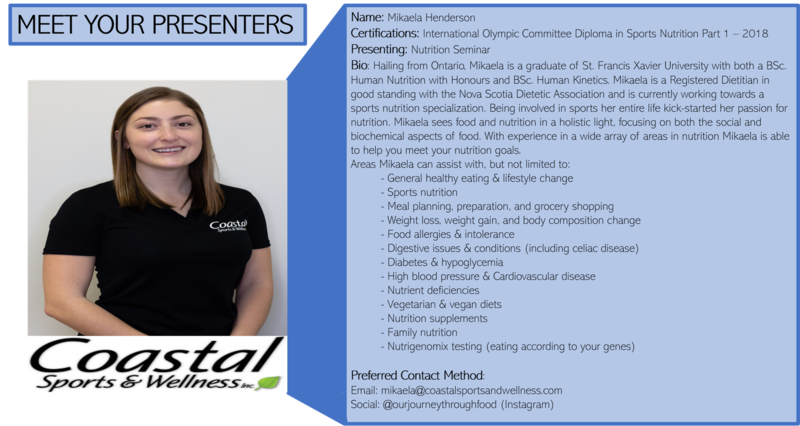 This session will focus on reviewing the NEW Canada’s Food Guide, busting some fad diet myths, and touching on some basic sport nutrition tips and tricks. HIIT is a form of interval training, a cardiovascular exercise strategy which is alternating short periods of all-out, one hundred percent effort through quick, intense bursts of exercise usually lasting around 20 to 60 seconds, followed by short active recovery periods lasting around 10 to 30 seconds. There is no universal duration for these types of workouts, however they typically last about 20 to 60 min. This type of training gets and keeps your heart rate (HR) up and burns more fat in less time. HIIT workouts provide improved athletic capacity as well as improved glucose metabolism. Research has shown that HIIT workouts produced significant reductions in the fat mass of the whole body. Come learn some new body weight exercises that will keep your body moving, HR raised and improved strength and conditioning. Chair Yoga opens the mindful practice of yoga to anyone who needs an easy and gentle class due to age, recovery, balance and/or mobility challenges. Mobility challenges include those who are unable to easily transfer down to a yoga mat. Some standing and seated postures will be demonstrated using a chair for support, and we will discuss how to modify postures and create a safe and beneficial practice. 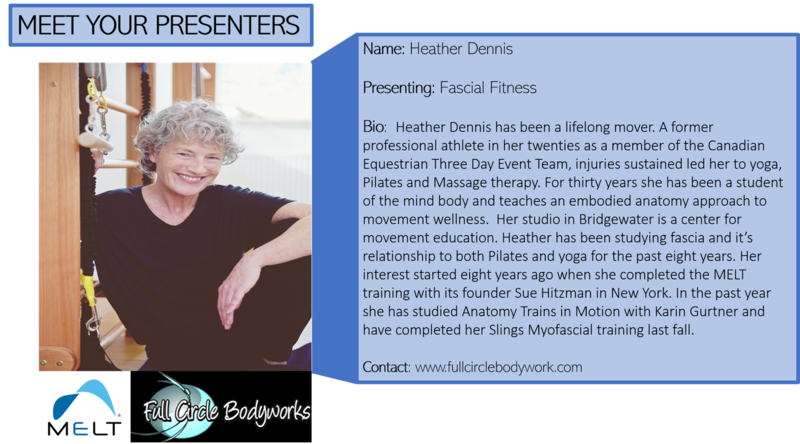 This session is recommended if you are considering certification, already teaching or considering teaching yoga, mind-body exercise or older adults, or if you are just curious about the practice. Come explore how stimulating, releasing and activating the fascia in the foot can affect whole body mobility, stability and balance. In this workshop we’ll use a small squash ball to influence the important plantar fascia and achilles tendon .and how they influence the superficial back line of the body which allows us to bend forward and stand up. This workshop will help address balance issues through improving the foot’s communication with the brain. Please bring a squash ball and a sense of fun and wonder. In our ongoing attempt to deliver a wide variety of content to our members during the summit we will be once again offering a non-exercise based session focused on enhancing ourselves as Fitness Professionals. Last years session with Greg Simmons on Fitness Trends vs Fitness Fads was very well received and he has agreed to return. Greg has been working full time in the fitness industry for over 25 years a Club Manager, Performance Specialist, Personal Trainer and Fitness Business Coach. This is your opportunity to tap into his experience and knowledge to get his perspective and answers to your burning questions. Ask him anything about being in the Fitness Profession,(Personal Branding, Acquiring Clients, Starting or Running a business, Programming Trends, dealing with difficult situations). Post your questions on our Facebook page at: https://www.facebook.com/NSFitnessAssoc/notifications/ or send questions via email to kaycie@nsfitness.ca and he will select as many questions as possible to address in his Coaches Corner session at the Summit. 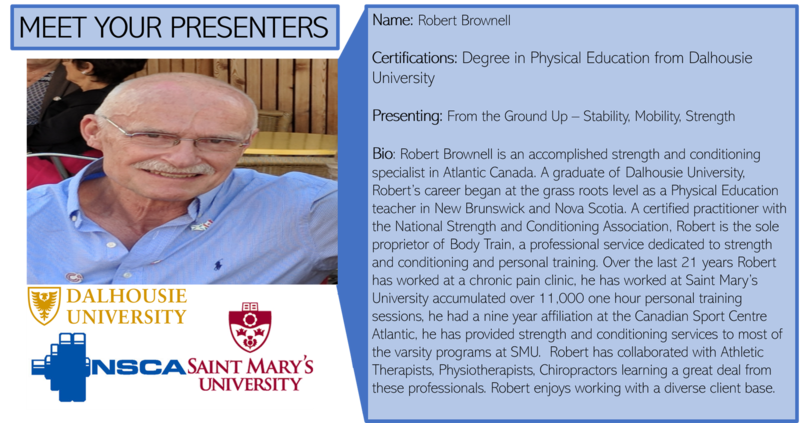 This presentation will review the meaning of stability and mobility. It will review which joints may require a greater degree of stability compared to other joints which may require a greater degree of mobility. The presentation will allow you to experience exercises that will strengthen muscles that surround ankle, knee, hip, spine, shoulder using minimal equipment. Some of the exercises will attempt to isolate certain muscles while other exercises will be of an integrated nature. You can attempt the exercises or observe or both, the hope is that you learn something new so that you can apply it in your practice. The ankle complex, the knee, the posterior chain, the hip and spine will be the areas of focus. Back lying ankle circles, back lying point and flex, the down drill, single leg squat with reduced ROM, knee drives (12” box), split squats (12” box), posterior chain circuit, side lying abduction of hip, adduction circuit, will be some of the exercises demonstrated during the presentation. It's hard to see the signs of domestic violence. It's even harder to know what to say. 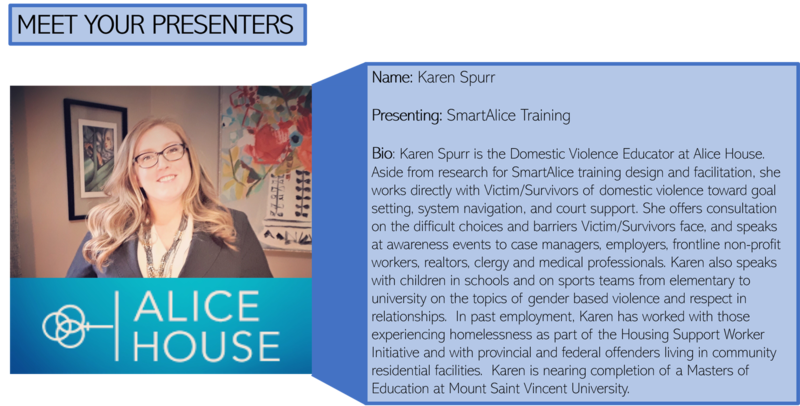 SmartAlice training provides an easy to remember action model to build participant skills in learning to see warning signs, believe the Victim/Survivor, support them with safety planning, and relieve isolation by providing appropriate referrals. Using an intersectional feminist lens, participants will investigate types of abuse and understand the challenges Victim/Survivors face. 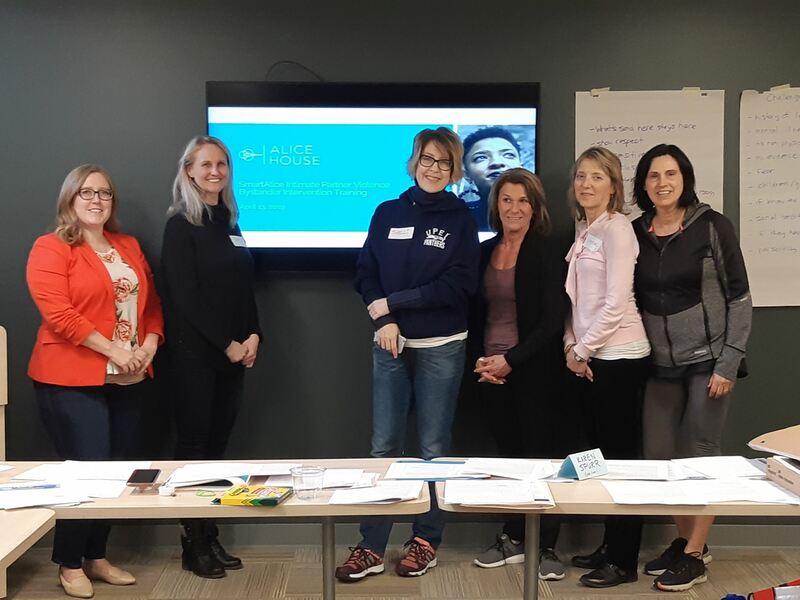 Participants will also learn how to collaboratively assess Victim/Survivor risk and provide support with attention to the scope of their practice so that they feel confident knowing how to begin that difficult conversation. 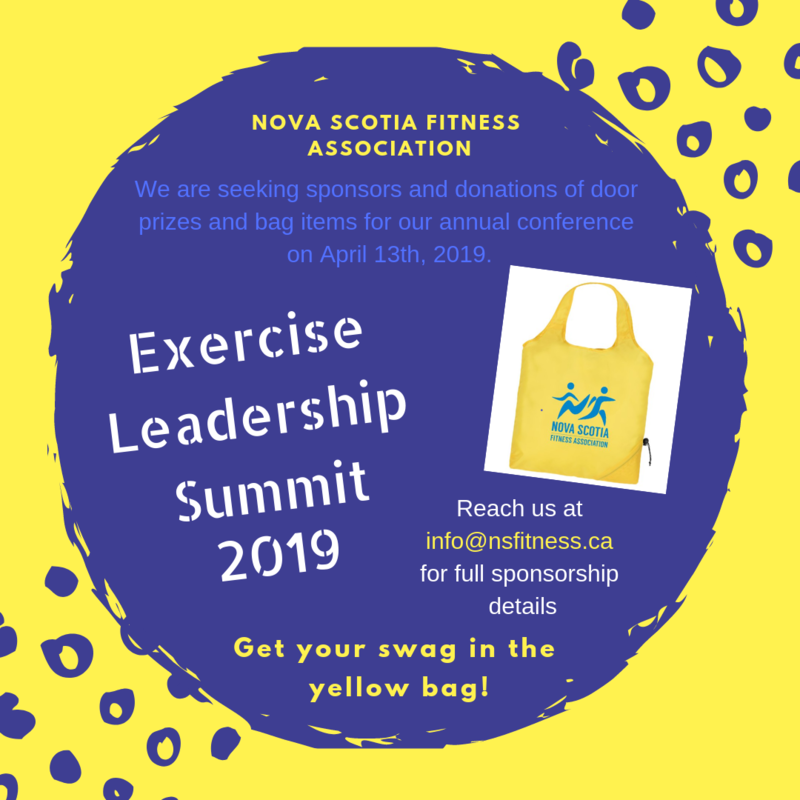 Why sponsor an NSFA event? We are a small but might group that punches well above our weight class when it comes to the value of your promotional dollar! Our certified instructors and trainers see an average of 15,000 Nova Scotians EVERY WEEK, and when we like a product or service, we talk about it. In addition to our members who are currently teaching, we are adding new student-members to our ranks all the time, and have had a 37% growth in membership over the last 5 years. In addition to our members seeing your materials, we also include you on this website under the list of sponsors for the event for each year, and we feature you on social media (Facebook, Twitter & Instagram) leading up to the event too. Contact us at info@nsfitness.ca to get the full details on sponsoring our events.